A career in the tourism and hospitality industry can be lucrative and rewarding, as you are exposed and introduced to a vast array of different career avenues, eventually finding just the right fit for you. At Village n Life, we are proud of our various internship programmes. These programmes have been specifically designed to help a young person gain practical experience in the tourism and hospitality industry, and gives them the space to explore that which truly interests them. As such a large hospitality and tourism company, there are several opportunities for interns to gain practical experience in their chosen field at Village n Life. 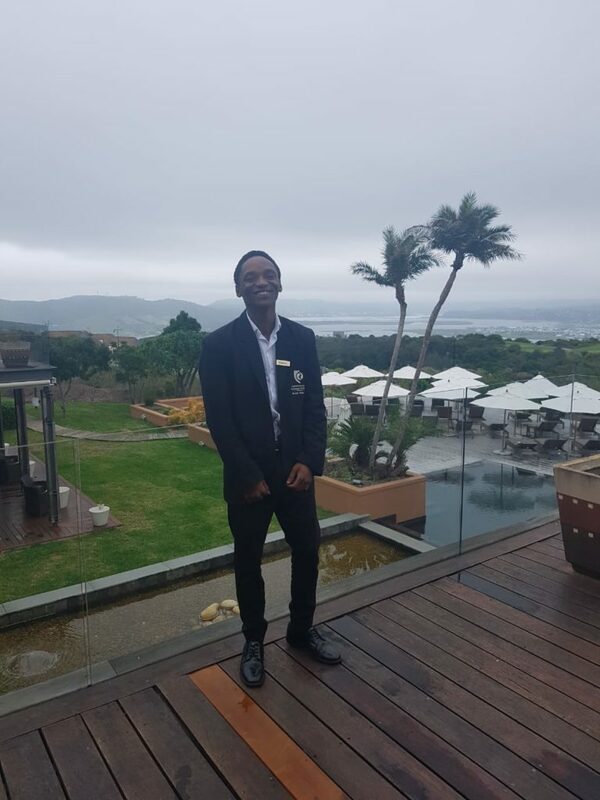 Two of our interns at the beautiful Pezula Hotel in Knysna recently gave us some insight in to what it’s like doing an internship at one of Village n Life’s hotels and what their plans for the future are. 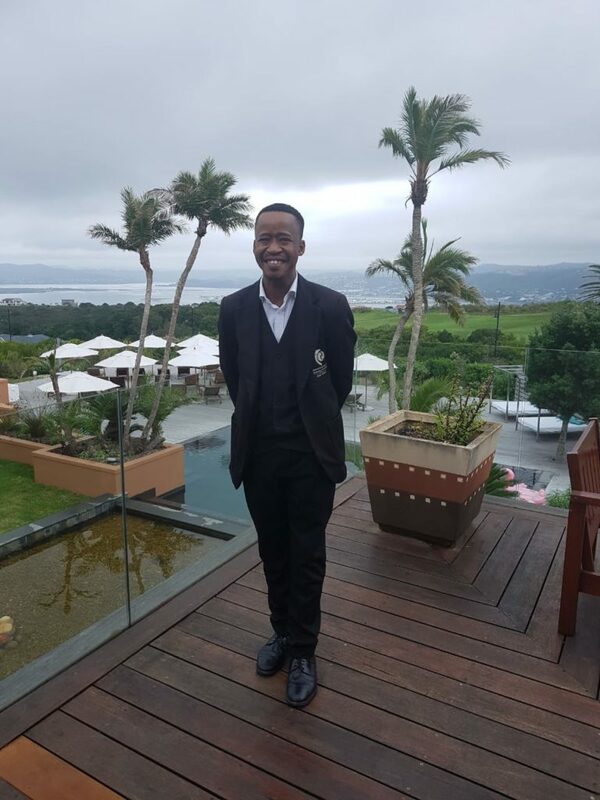 Khotso Moletsane is busy with his third year, and currently works in the Rooms Division at Pezula Hotel. He is originally from the Free State and has been at Pezula Hotel since December 2018. We asked Khotso some questions about his internship and his personal life, and what plans he has for his future. What do you enjoy most about your internship at Pezula Hotel? I have really enjoyed being a Porter and working at Reception. It is very different at Pezula than at any other property I have worked at before. The experience has put me in a position to interact with different people, which I really like. What is the most interesting thing you have learnt since you started? I have realized the importance of communication and teamwork, as they are the backbone to providing good customer service. I have also learnt to follow procedure in every way possible – this way, mistakes are spotted and rectified. If you are ignorant you will keep falling short of providing the best service. Above all, a great mental attitude is essential. I have also really enjoyed being exposed to different departments as this helps to outline how the whole operation comes together. What made you decide to pursue a career in hospitality and an internship at Pezula Hotel? I studied Tourism & Consumer studies in high school, and it sparked my interest and I decided to move into Hospitality. My passion is culinary studies, and I originally wanted to become a Chef. Currently, I enjoy housekeeping, and I am experiencing parts of Housekeeping that I have never been exposed to before. I love taking part in adrenaline-filled activities. My Grandfather was the head of our Church, and my Dad is good with his hands and is a great builder. Who is your mentor and what is the most important thing you have learnt from them? Mentor at Pezula: Tracy Hoff. She is a great example of how to help exceed guests’ expectations and make sure they have an unforgettable experience. Role model in my life: Vuyo Thembekwayo – I enjoy his insight on South Africa, business and entrepreneurship. How are you experiencing the Western Cape and the Garden route vs the Free State? I love the landscape. The mountains are scenic, the weather is bearable and the forestry that make it up is amazing. Based on my time in Plettenberg Bay and Knysna, I would like to see more, it is a really good destination for leisure. I still want to ‘flirt’ with a couple of stuff and other avenues, but I am mostly leaning towards the kitchen and housekeeping. Khotso has two older brothers. His father is Amos Moletsane and his mother is Senobane Moletsane, and we’re sure they are very proud of their son! You can follow Khotso on Instagram at @khotso_m60. Tshegofatso Masisi is also in his third year and in the Rooms division at Pezula Hotel. Like Khotso, he is also originally from the Free State, and has also been at Pezula Hotel since December 2018. We asked Tshego the same questions; how he is finding his experience at Pezula Hotel and what he sees for his future. I have met new people and made new friends. I enjoy finding out why people have chosen Pezula as a place to work, but also why guests have chosen to stay here. There is such a vast range of reasons people end up at Pezula and I find it extremely interesting. I have been exposed to 2 different languages that I have never been exposed to (Xhosa and Afrikaans) – and I am really enjoying learning the languages. I also like that my colleagues encourage each other to do better, especially the front office team. How to communicate with guests – especially if they are a little bit more difficult! Finding the right words, and building rapport with guests and engaging with them. I love talking and hosting people. Hospitality was the most logical industry for me to pursue. I chose Pezula due to its location. I am from the Free State, and this is my first time in the Western Cape. Pezula is completely different to any other property that I have been exposed to. I have a very close relationship with my family. We have a farm, and we enjoy spending time at the farm as a family. I have been living away from home since I was 15 years old – I went to boarding school when I was 15. Mentor at Pezula: Tracy Hoff. Her work ethic, always doing what is required to ensure that the operation succeeds, and ensuring that the guests are happy inspires me. Mentor in my life: My cousin, Sam. Sam is a go-getter, and never backs down. He sets out what he wants to do, and makes sure that he reaches his goals. He truly inspires me. I have not travelled much. The western Cape is a very beautiful part of South Africa. The community and people are also very different – they have their own culture, they are more friendly and welcoming. I would love to move to the western Cape and continue my career at Pezula after my internship. I never used to like the front office department, and have previously seen myself continuing my career in food & beverage. Since I have started working at Pezula, however, I have developed a passion for front office and hosting, and I would like to explore this part of hospitality. Tshegofatso has one brother and one sister. His father is George Masisi and his mother is Portia Masisi, and we’re sure they are very proud of his achievements. You can follow Tshegofatso on Instagram at @mamepekaskgoa.